Cathy came to IPPL in 2007 with her parents, Erin and Ziggy, from a sanctuary in Texas. Cathy lived with her parents for about five more years, but in 2012 we began to see tensions develop between her and Erin. In the wild, youngsters will take a hint at this point and establish their own territory elsewhere. 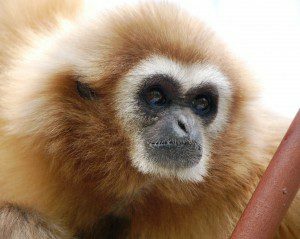 So, on February 23, we removed her from her parents’ enclosure and set her up in Gibbon House #9, right next to handsome Michael. The two were very obviously compatible, and we were able to remove all physical barriers between them on March 5. Cathy doesn’t seem to desire much interaction with humans, possibly due to her fairly natural upbringing with lots of contact with her parents. Cathy generally keeps her distance from people and can often be seen sitting in her observation tower or in high aerial runways. Since being paired with Michael, she has come out of her shell a little. She will occasionally accept treats like peanuts and dried banana chips directly from her human caregivers and even respond when we call her name.